The first screening of our 3rd Annual Women's Film Series kicks off with (T) ERROR followed by a post-screening Q&A with co-director Lyric R. Cabral. The Women's Film Series showcases an incredible lineup of talented directors and award-winning documentaries running from October 4-14th, 2017. 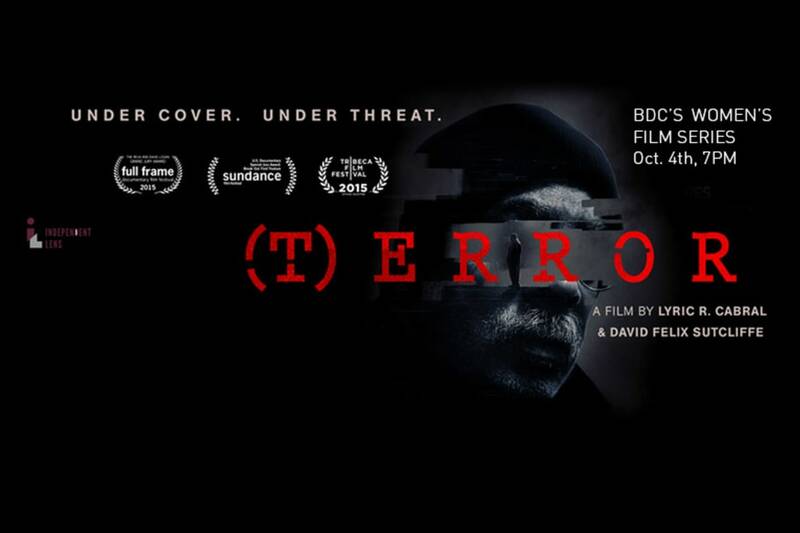 (T) ERROR is the story of a 62-year-old Black Panther-turned counterterrorism informant for the Federal Bureau of Investigation. It is the first film to document a covert terrorism sting as it unfolds. This discussion will be moderated by Olivia Adechi, BDC Program Coordinator and Gallery Manager. Lyric R Cabral is a photojournalist, filmmaker, and cinematographer documenting stories seldom seen in mainstream media. Her verité works explore the intersections of race, religion, and surveillance in the United States. (T)ERROR, her first feature-length documentary, co-directed with David Felix Sutcliffe, which premiered at the 2015 Sundance Film Festival, where it won a Special Jury Prize for Break Out First Feature. Suggested donation: $5 Bronx Residents, $10 General, Free for 18-and-under.